Wading through the surf at Guayabitos, a charming fishing village on Mexico’s Pacific coast, Rick Bayless sets off in search of the ultimate catch—the Mexican seafood dish that captures everything that’s perfect and irresistible about a day at the beach. For starters, he checks out what’s shaking at a thatch-roofed laguna-side restaurant not far from Puerto Vallarta, where the "specialty of the hut" is Pescado Zarandeado, "Shaken Fish," seasoned with a sweet-spicy red chile marinade, flame-seared and flipped over hot coals in a special grilling basket. At home in Chicago, Rick shows us how to recreate this dramatic dish on a backyard barbecue. Then it’s back to Mexico City, to check out the cooler side of seafood at the sleek, modern Manzanilla restaurant, where a lively young couple from Baja California serves up a series of refreshing raw seafood specialties with the Zen-like simplicity of a cutting-edge sashimi bar. In the kitchen of his own Frontera Grill, Rick gives pointers on the seafood "laws of raw," from judging freshness to serving ideas. It’s all about getting as close to the source as you can. And with that in mind, Rick buys some fish right off a boat at Guayabitos, and then shows us how to make a bright, fresh Ceviche Salad—a weeknight main dish that’s ready in minutes. 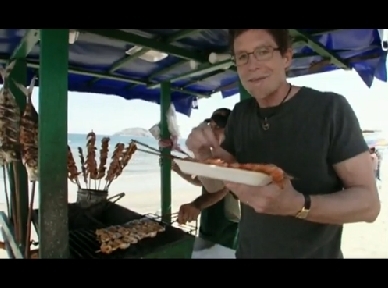 The quest ends right where it began, back on the shore, where Rick discovers what might just be the ultimate beach food: juicy just-caught shrimp, grilled with a little lime juice on—of all things—a bicycle!